Percy Bysshe Shelley (1792 - 1822) is regarded among the finest lyric poets in the English language. His unconventional life and uncompromising idealism made him an authoritative figure during his life and afterward. He became an idol of the next generations of poets, including Alfred Lord Tennyson, Dante Gabriel Rossetti, Lord Byron, William Butler Yeats, and Henry David Thoreau. In 1822, one month before his 30th birthday, Shelley drowned in a storm while sailing in his schooner. Some believed that his death was not accidental, because Shelley was depressed in those days and that he wanted to die. 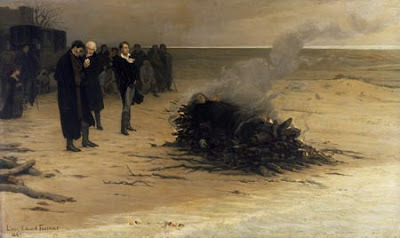 Shelley's body washed ashore and later cremated on the beach, in keeping with quarantine regulations. All volumes are available for download or online viewing.